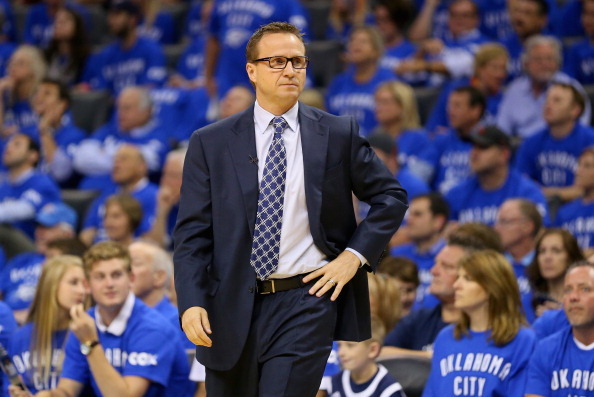 It seems Scott Brooks is finally making adjustments, something he’s always been criticized for not doing and relying on the talent of his players to make up for tactical ability from their head coach. Not that he’s not still putting the ball in the hands of Kevin Durant and Russell Westbrook, but he has made changes to his lineup that weren’t doomed to fail from the beginning, as the return of Serge Ibaka enabled him to give up on Thabo Sefolosha and insert Reggie Jackson into the starting lineup. Brooks was slightly in a jam during the first two games of the series against the Spurs because Ibaka wasn’t playing. The lineup with Kendrick Perkins and Nick Collison worked defensively, and Thabo Sefolosha is a more than capable wing defender. However, not having Serge Ibaka in the lineup hurt the Thunder badly in terms of giving Durant and Westbrook a third outlet to pass to. Putting Reggie Jackson on the floor hurt the team on defense, using Thabo Sefolosha meant having three players who can’t score. Ibaka changes all of that. It gives the Thunder a much more mobile defensive big man who can block better than anyone in the league and also hit mid range jumpers with precision if left open. The way Durant and Westbrook have been slashing through defenses, it’s a sure thing at least one player will be left open, and Westbrook especially did an excellent job of finding open players when he wasn’t busy ruining his field goal percentage, as always. Sefolosha might have played for the final time as a Thunder player. It’s still a long way to go before this postseason is over, and you never know when someone is going to be needed and become important. Just look at Rashard Lewis for the Heat. However, Brooks isn’t someone who flip flops and like Frank Vogel, has usually one way he sticks to, trusting that the talent and athleticism prevail. Sefolosha, at his current shooting ability, isn’t needed, while his defense doesn’t mean much with Ibaka back in the lineup. Reggie Jackson has had his ups and down in these playoffs, and usually more touches and good basketball from him means a better Thunder team. With so much focus going to Durant and Westbrook (maybe something the Spurs need to consider changing defensively and keep it on one on one with them), Jackson has more open looks, and has the ability to beat players who don’t get help against him. In the lineup next to Westbrook also helps take the pressure of ball handling off of Westbrook, making him play more like the shooting guard he is more like. We have at least three more games ahead of us. The Thunder’s dominance in game 3 came with some officiating help, which isn’t something that can be planned for, although the Thunder have been enjoying it a fair deal in these playoffs so far. The Spurs will attack from different angles and play in different lineups to the ones that struggled so badly in game 3 during the third quarter. 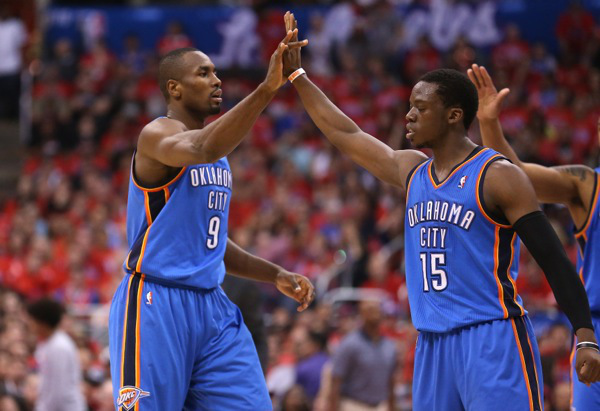 It’s going to take more than just the return of Ibaka to make sure they fail again.